As of 10 a.m. this morning Lois is 62 inches tall – just two inches taller than yesterday. (As you can see in the chart below she’s been growing 3 – 4 inches per day for more than a week so far). Her outer bracts continue to droop and fall off, indicating that she should open very soon. Our predictions remain the same, we believe she will open either this afternoon or tomorrow afternoon, Sunday, July 11. It’s beginning to look likely that the opening will be tomorrow – but this plant is very unpredictable. 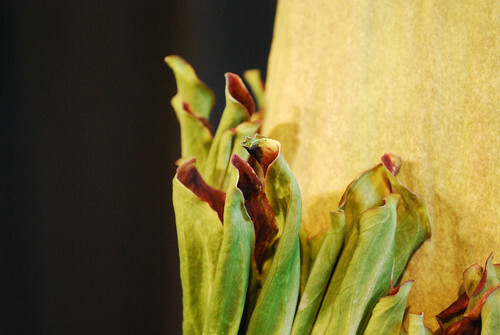 See a full set of photos of the Corpse Flower’s growth here. Thanks for the updated pictures. Just to let you know, all the pictures in Flickr for today are labeled as June and not July. Whoops! For some reason, I can’t get it into my head that July = 7. Thanks for the heads up – we’ve made the update. I have a Mac using Snow Leopard and haven’t added any “special” video programs. I had no trouble viewing the videos. I am so glad to hear it! Thanks for letting us know how it is working for you! This is really pretty thrilling, considering we are all watching a plant! 🙂 Is the museum considering extending hours if Lois blooms later tomorrow? Yes! If she starts blooming tomorrow, we are prepared to stay open late. Call 713-639-4629 before you come to make sure we’re open. Where is the corpse flower displayed? in the grand hall or in the butterfly center? I’ll be watching! Thanks for the updates. It will be very interesting to see what happens when public visitation starts. We’re gearing up for our upcoming flowering! The Mac Plug in works! Yes! Hi Brian – Lois is in the Butterfly Center, in the second floor lobby between the rainforest area and the insect exhibits. As far as I know, she’s been in there since we first moved her out of the greenhouses last weekend. But, if you’ve got a link showing her in the Grand Hall, I’d love to see it! Hope to see you here – we’re thinking Lois will flower tonight! Apologies in advance if this has been asked a million times already, but I just found out about this last night. Once Lois blooms, how long do we have to see it? A day? An hour? Two days? for @etee, try rebooting. I get a reasonable video stream on my mac that updates about every 10-20 seconds. Very pixelated but I just saw David and Nicole there. Hi Michelle – no worries! Once Lois blooms, she’ll likely be open for 1 – 2 days. But, she will only smell for 8 – 12 hours. Hope to see you here! Erin, will we be able to get my Mom in there in her wheelchair to see this? Today is her birthday and we are planning on coming down later today or tomorrow. We can’t wait to see Lois! Hi Scott – yes, the museum is wheelchair accessible. There is an elevator in the butterfly center that lets out right into the lobby where Lois is being displayed. However, it is quite crowded and it can get hot with lots of people in there, just thought you might want to know that, too. Sorry, I thought one of the pictures was from the grand hall, never mind. If she does start to bloom this afternoon, when on Monday should she be fully bloomed? Also, when on Tuesday should she still look the best? We will be open until midnight tonight and again at 6 am tomorrow – hope to see you! Thank you. What is the current prediction on when she should bloom? It’s still possible Lois will bloom today, but it may still be tomorrow. We will have extended hours (check here for updates on exactly what they are) until she blooms. When you mean extended hours until she blooms, you mean if she blooms today, there will be extended hours tomorrow? We are definitely having extended hours today, whether or not she blooms. If she doesn’t, we will also have extended hours tomorrow. And we’ll repeat that until she blooms. so everyone just gave up? Previous Post Corpse Flower Watch: Webcam! Name Our New Corpse Flower: Voting Time! Name Our New Corpse Flower! Click Here To Post Your Name Ideas! VIDEO: Our New Corpse Flower. Help Us Name Her!